I finally got to spend some time in my sewing room this weekend and finished up my Maple Leaves tutorial for the Glorious Autumn Quilter’s Block Party. Welcome to Block 39 of our Glorious Autumn Block Party. Today we have Nan Baker as our featured designer and Super Deal savings from Craftsy. Plus, don’t miss Nan’s great give-away too. 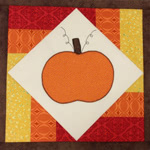 Today we have Konda Luckau as our featured designer and Super Deal savings from Craftsy. Plus, don’t miss Konda’s give-away too. Welcome to Block 36 of our Glorious Autumn Block Party. Today we have Cara Wilson as our featured designer and Super Deal savings from Craftsy.